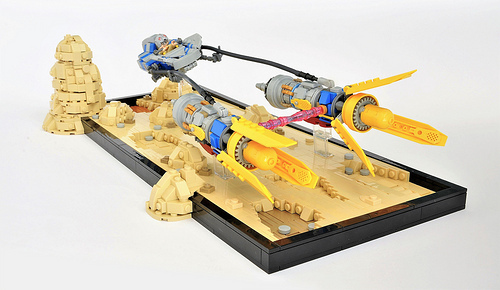 Definitely there are not many reasons to visit Tatooine, but watching a beautiful podracer like this one by Inthert in action is totally worth booking a seat at Mos Espa Grand Arena. My favorite piece of the pod’s design would be multiple use of yellow minifig snowshoes, which are used to create front winglets. And, of course, a very simple piece of Tatooine’s landscape beneath the pod is an amazing way to make a still model look very dynamic.